Megalyn Echikunwoke at the New York premiere of "Fix." Megalyn Echikunwoke at the after party of the New York premiere of "Fix." Megalyn Echikunwoke as Rose in "Damsels in Distress." Megalyn Echikunwoke at the Rebecca Beeson Fall 2005 show. Olivia Wilde and Megalyn Echikunwoke at the Fox Fall Season Launch Event. Megalyn Echikunwoke at the 1st Historic Health Summit kick-off luncheon. Megalyn Echikunwoke at the Fox Fall Season Launch Event. Megalyn Echikunwoke at the Rock and Republic Fashion show. Megalyn Echikunwoke at the Declare Yourself 2008 Celebrates 18. Megalyn Echikunwoke at the Crest and Scope People's Choice nomination announcement. Megalyn Echikunwoke and Olivia Wilde at the Rock and Republic Fashion show. Megalyn Echikunwoke at the premiere of "Alpha Dog." 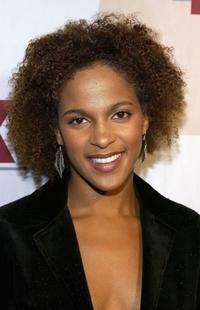 Megalyn Echikunwoke at the WB Television Network's 2003 All Star Party. Megalyn Echikunwoke at the Black and White Gala for Barack Obama. Megalyn Echikunwoke at the 2008 Sundance Film Festival. Megalyn Echikunwoke at the 18th Annual Environmental Media Awards. Megalyn Echikunwoke at the FOX-TV's party for Television Critics Association.